About Danni B — Dannibindubai — "Dubai based British Revert"
The cheese pull trend has come to Dubai! I moved to Dubai in the early autumn of 2013 and became a revert to Islam in 2018 after almost three years of learning. I initially moved to Dubai because I’d left my job in London and gone to teach English in Japan but I wasn’t happy in Japan. After speaking to a friend, who was living in Dubai at the time, they told me, “I think you’ll love it here” and helped me to get an interview with their company. Before I knew it I was handing in my notice, packing my stuff and jumping on a plane to Dubai. I quickly fell in love with the city, started learning about the culture and now couldn’t imagine living in a none-Islamic country especially as a revert. As the plane started to descend into Dubai, for the very first time I saw the Burj Khalifa sparkling in the sunlight and the dusty sands blowing across the new landscape. The excitement of being in a new city tingled through my body. My eyes lit up as the skyline came closer before me. I grabbed my suitcase and jumped into a taxi, passing by in awe at all the tall skyscrapers. They were the highest I’d ever seen and shimmered in beautiful hues of blues, pinks and oranges from the dusk. I’ll never forget this first journey through Dubai. For the first couple of months, I was full of wonder. I loved everything about Dubai and blew through my savings wanting to try everything possible! If there was a new restaurant or a new experience I was there! I spent way too much money in those first few months but I definitely had a thirst to discover the whole of the city. I went dune bashing, I lounged in five-star hotels and began to meet for the first time practising Muslims. Originally the blog was focused on Dubai and your ultimate guide to all things Dubai. There was also some elements of travel but mostly focused on places that were easy to get to from Dubai. 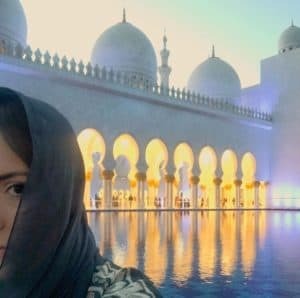 Always within my blog and Instagram, I had desired to dispell the myths about Muslim countries and what it was like to live or travel in them due to having such a positive experience here myself. However, when I decided to make a even bigger change within myself by becoming a revert, I realised that my blog could have an even bigger purpose while still continuing to dispell these myths. I first started learning about Islam in 2016 when I met an American revert who also had a passion for travelling. She opened the door to myself starting to learn and fixed some of the issues I’d had with monotheistic religions, particularly Christianity since I was raised Christian. At the time I thought she was crazy to convert/revert to Islam. I never saw myself becoming a Muslim. 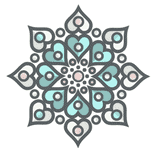 It took me a long time to finally accept Islam and I realised after meeting people in my local Islamic centre, listening to the stories of reverts and others Muslims that I too wanted to share whatever knowledge I could. I decided to keep elements of my original blog with guides to Dubai, for those wishing to visit the city, as it’s ideal for Muslim travellers. I also added articles to help reverts along with halal travel. Thus combining all my passions together into one useful source for Muslims, reverts and curious souls. After all, without the reverts and sources online, I wouldn’t be a revert or where I am today. Alhamdullilah. For more regular but short updates, you can follow my Instagram (photos below) and my blog will always give more in-depth information. *Any post featuring products or services is always an honest review and I try to make posts as helpful as possible. As if I was giving advice to my friends. I will always let you know if I received anything for free or was paid but regardless I will always give an honest opinion. I don’t do sponsorships with brands unless I like them myself. So welcome to my friendship circle and hope you enjoy my posts! I always love to get feedback, so feel free to comment on my posts and tell me how I can improve or what you’d like to know or see more of! Get all the lastest blog posts including Islamic lifestyle, Halal travel, Dubai living and modest fashion plus special offers and ways to save money and handy tips for new reverts.